DoubleDragon Properties Inc. said Wednesday it has secured its 14th site for the planned chain of community malls under CityMall brand. DoubleDragon said in a disclosure to the stock exchange unit CityMalls Commercial Center signed a joint venture for a 1.1-hectare prime commercial center along Araneta Street in Bacolod City where CityMall-Goldenfields Bacolod will be constructed. The company said the site was an integral part of the six-hectare Goldenfields Commercial Complex that would soon be redeveloped as a new and vibrant mixed-use development to serve northern part of Bacolod. 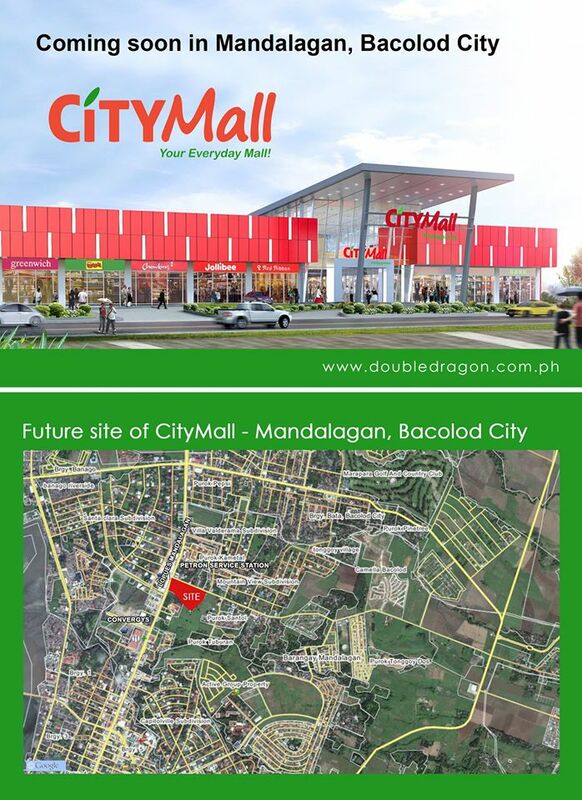 “CityMall-Goldenfields Bacolod is another prime and strategic site secured by CMCCI and put the company on track to meet the goal of completing and operating 25 CityMalls by the end of 2015 and 100 CityMalls by 2020,” DoubleDragon said. The future site is located across the old Bacolod Airport and is only a few meters from the numerous residential subdivisions, schools and commercial establishments that surround it. Bacolod City is the capital and center of commerce and finance in Negros Occidental and is the most populous city in Western Visayas. DoubleDragon, which was listed with the Philippine Stock Exchange in February, aims to become one of the largest commercial and residential developers by 2020. It expects net income to reach P1 billion by 2016 and P4.8 billion by 2020. The developer plans to spend P24 billion to build 100 CityMalls stores across the country with a gross floor area of 700,000 square meters. DoubleDragon is set to open five CityMalls this year alone. DoubleDragon is a 50-50 joint venture between Injap Investments Inc. of Edgar Sia and Honeystar Holdings Corp. of Jollibee Foods Corp. chairman Tony Tan Caktiong. DoubleDragon owns a 66-percent stake in CMCCI while the remaining 34 percent is owned by SM Investments Corp. of tycoon Henry Sy. DoubleDragon raised P7.4 billion in October from the issuance of seven-year fixed rate notes. Proceeds from the corporate notes issue will be used to finance capital expenditures primarily for rollout of community malls as well as office and leasing businesses including DoubleDragon Plaza at the Meridian Park, Dragon8 Shopping Center-Divisoria and The Skysuites Tower in Quezon City.